Over the past few years I've experimented with a few pickups on my strats. And in the process of deciding which ones to keep and which ones to sell, I've recorded them all playing the same piece of music. It's been a simple matter then to play back the recording and solo first one pickup and then another and immediately hear the tonal shift (if any). For a long time I planned to build a Flash app that would allow me to upload the same tracks and let you do the same thing. But Adobe is shelving Flash for the web and anyway everyone got iPads for Christmas (didn't they?) so it's time to offer up the same thing in honest-to-goodness HTML5. It's impossible to judge a pickup by the manufacturer's description. This <yourbrandhere> humbucker is warm, fat and sweet, with serious vintage tone, loads of poke and grunt and bags of sustain. Wow! I'll have three! Who is to say that these attributes belong to the pickup and not the bridge, the body, the fingerboard, the nut or even the strings? In fact, any guitar sound is the result of all of these things and the pickup is just the last link in the chain (well, maybe second last - orange drop caps anyone?). You choose the pickups that best complement your combination of wood and metal and assembly. The pickup test suite strips away the band, the studio and even the amp. The test track includes arpeggios, strummed chords, octaves and single notes running from low G to high A. Although the original track was set up to let me hear how the guitar pickups sounded in context, for the purpose of comparison here everything has been stripped away - even the amp simulation. So instead of a full track the two pickup tracks are muted and soloed alternately every bar until the last 4 bars so that you can compare A to B. All tests are recorded by plugging the guitar straight into a MOTU 828 MkII and then into Apple's Logic Pro at 24bit 44.1kHz. Guitar tone controls are wide open and volume up full. Strings are D'Addario 11-49. All pickup tracks are normalised. Tracks are exported at CD quality and encoded using Apple's Lossless codec (ALAC - now open source) and Ogg Vorbis 320kbps CBR. None of this matters too much though. 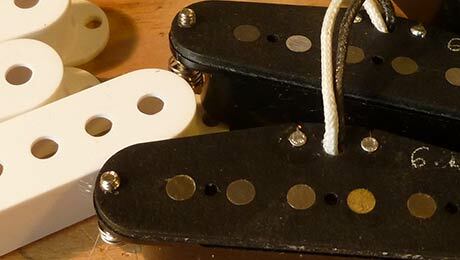 The point is you can hear the difference between pickup tones. There isn't better or worse, just different. Thanks to @manguitartech who wanted to hear the comparisons without knowing which was which. As a result I've hidden that information in spoiler tags at the end of each bakeoff. Just drag/select the blacked out text to see what's what.